Most fertilizers currently available also contain weed reduction properties. Catching up with a commercial lawn care provider can help you identify fertilizers that not only boost the health of your lawn but also prevent weed regeneration. Note that even if a fertilizer doesn’t contain weeding compounds, it effectively reduces the amount of weed by allowing for the speedy growth of strong, thick and deep roots. The resulting even grass cover hampers the growth of weed. A commercial lawn care professional will also advise that fertilizing the home gardens and backyard goes a long way in improving the health of your plants. Fertilization involves the addition of minerals and other ingredients that improve the quality of life for these plants. Various types of fertilizers used by the professionals have also been found to impact different parts of the plants such as increasing the size of the number of offshoots, leaf size, and even flowering. It is, therefore, important that you consult a lawn care expert for advice on the type of fertilizer best suited for your lawn. What happens when you don’t have an even grass cover for your backyards and lawns during the heavy rains and storms? You are likely to experience a soil-run off that not only carries along the healthy top-layer soil but also defaces your lawn. A Granger and Mishawaka property owner can, however, avoid this by fertilizing the lawn. This results in well-covered grounds with strong and thick grass that withstands heavy downpours and maintains the dignity of the lawn by preventing erosion. Pets, when left uncontrolled, can cause havoc to your lawn by destroying the leaves and negatively impacting the heath of the plants. In such a case, a homeowner is advised to not only result to pesticides, commercial fertilizing experts advocate for the use of fertilizers with insecticide and pesticide compounds. Note that thicker grass and well covered lawns also make it hard for pests to establish a footprint. House flipping agents and other experienced realtors consider well maintained lawns a key step towards increasing the value of your South Bend, IN property. This explains why most agents advise that you include commercial lawn care among the home improvement must-dos before listing your home for sale. They also advise that while the commercial lawn care cost may be negligible, it has significant impact in increasing the property value. 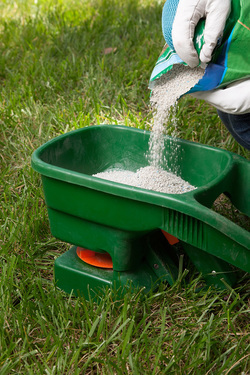 Home and property owners are encouraged to consider fertilizing their lawns in Granger and Mishawaka, Indiana regularly if you they hope to reap the benefits maintenance affords them. For instance, it improves the aesthetic appeal and value of their property. Most importantly, it has a positive impact on the health of the grass and also plays a key role in preventing soil.